Can you use a calculator on the GRE general test? Absolutely, but you cannot bring your own calculator to use on test day. If you take the computerized test, you’ll be able to use the simple, on-screen GRE calculator for the Quantitative Reasoning sections; if you take the paper test, a similar calculator will be provided to you. Make sure you’re using the right kind of calculator in your GRE studying! Learn more about the calculator that’s provided to you on the GRE general test with this guide. 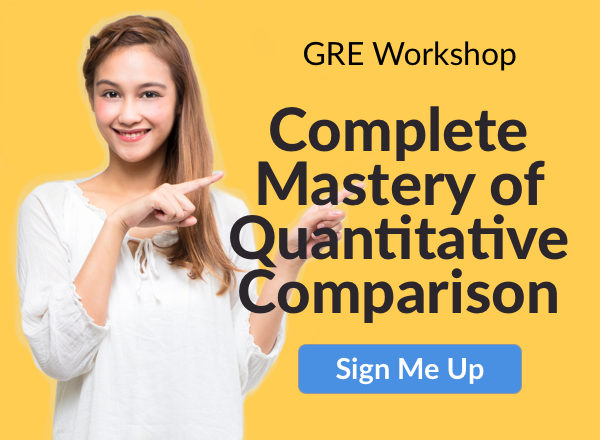 I’ll cover exactly what all the buttons do and how to use the GRE calculator to improve your score. feature image credit: Calculator/used under CC BY 2.0/Cropped from original. The GRE Calculator: What Can It Do? 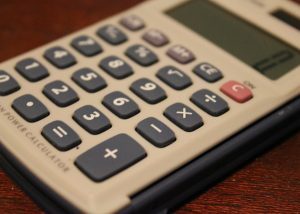 You can choose to show or hide the on-screen calculator throughout the Quantitative Reasoning sections – you don’t have to have it on your screen for every question, potentially distracting you and taking up valuable screen real estate. The GRE calculator allows you to add, subtract, divide, multiply, parenthesize, take the square root of, add a decimal to, or change the sign (positive/negative) of numbers. You can also store and recall answers for future use using the MR, MC, and M+ keys, same as with a normal four-function calculator. 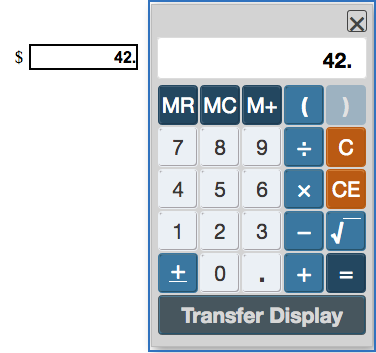 One final function of the GRE calculator allows you to transfer the answer from the display exactly to the answer box. This feature can be helpful, but it also comes with some problems (more on that later). The calculator display is 8 digits long, including decimals. In the image below, I’ve labeled each of the non-numerical functions of the GRE calculator. I’ll go through all of the functions below. If your calculator has this blue outline, then it will recognize any commands you type using your computer keyboard. The calculator has digits 0-9, arranged like a phone keypad. You can enter using numbers by using the computer keyboard or by clicking on numbers individually with the cursor. Clear all input. This doesn’t clear the memory if you’ve stored something using M+, but it does clear any other functions and numbers you’ve entered into the calculator and sets the default screen back to 0. The Clear Entry button clears the last number you put in, but it doesn’t get rid of the whole equation. For example, let’s say you wanted to divide 16184.88 by 4, but accidentally put in “5” instead of 4, CE would get rid of the 5 and allow you to put in 4 without having to retype in “16184 ÷”. This can be time-saving if you have a lengthy equation like (16184.88-3216)/4. In general, though, you can get by without using CE and just going with plain old “C” instead and reentering the calculation. 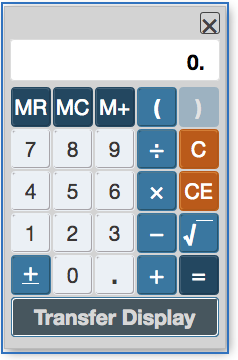 If you press “C” or “CE,” the calculator display will clear…but the answer entry will not. Use this button to delineate decimals, like 3.14 or 2.7. The GRE uses the American system of decimals so that they’re written using a period, not a comma. For example, 200 + 15/100 would be written 200.15 (not 200,15). Use this button to toggle back and forth between positive or negative for a number. Unlike with many computer calculators, you can’t use the keyboard shortcut “-” to make a number negative — you must use this button. Use this button to take the square root of a number. You must first enter in the number you want to take the square root of, then click then “root” sign. If you try to take the square root of a negative number, you’ll get an error message. Use this function for division of one number by the other. Use this function for subtraction of one number by the other. Parentheses are useful for manipulating order of operations. Like most cellphone calculators these days, the GRE calculator follows PEMDAS (parentheses, exponents, multiplication, division, addition, subtraction). This means that the part of the equation in parentheses is the part that gets processed first, followed by any division/multiplication, then any addition/subtraction. because the calculator divides 6 by 5 before adding 4. To add 4 to 6 first, you need to use parentheses. And yes, with numbers this small (4+6) you probably wouldn’t be using the calculator anyway, but this example can be applied to more complex numbers. You can also use “return” or “enter” key on the keyboard as a shortcut. Use this button to get a result of a function (addition, subtraction, multiplication, division, and so on). The equals sign is also useful for getting around the calculator’s order of operations. Instead of solving 16/2, 43-59, and then plugging it all in, you can just use the equals sign to answer it one step at a time. 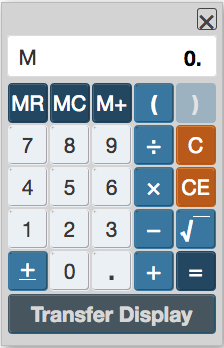 To store an answer for later use in calculations, hit “M+”. An M will appear to the left of the display to show that an answer’s been stored. To recall a stored answer, hit MR. You can do this to begin a calculation (e.g. MR – 8) or at the end of a calculation (e.g. 86/MR). To clear the stored answer, hit MC. You’ll know it was successful when the “M” disappears from the lefthand side of the display. My advice about the memory functions: If you’re able to become comfortable with them (or you already are comfortable with them), great! Use them to your advantage. If you don’t want to invest the time into learning how to use the buttons and instead prefer to use some combination of parentheses, equals, and writing down numbers on scratch paper…that’s also perfectly acceptable, and way better than getting nervous and misusing the functions on the GRE. Bottom line: only use M+, MR, and MC if they make the GRE easier for you. You can then click “transfer display” to transfer answer from calculator to the answer area on the test. 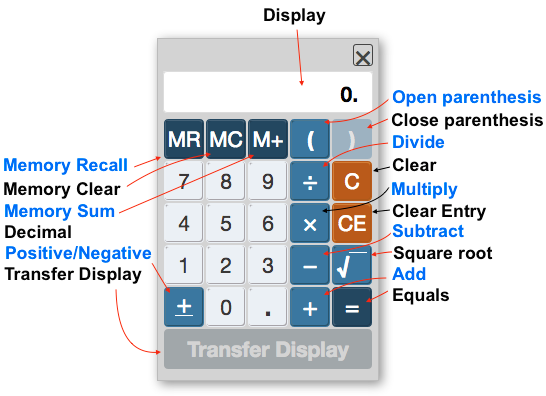 Transfer display does not work with questions with fractional answers, even if they’re Numeric Entry boxes – you have to manually enter in the numbers to the top and the bottom of the fraction. 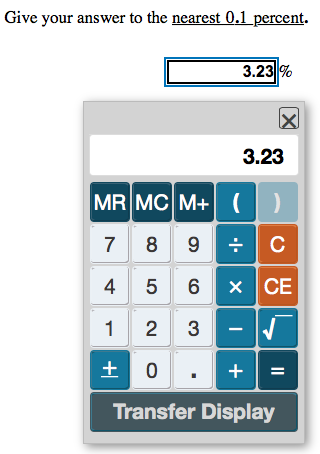 That doesn’t look rounded to one decimal place to me, GRE calculator! What’s Not on the GRE Calculator? The GRE on-screen calculator has some functions missing that you might normally expect to find on your average scientific calculator. No exponents or squaring or cubing. If you want to find out, for instance, what 32 cubed is, you have to manually multiply out 32 times 32 times 32 on the GRE calculator. No constants like π or e.
No logarithmic (ln, log) or trigonometric (sine, cosine, tangent) functions. No nested parentheses (see above discussion of the GRE calculator’s parentheses function). What about if you’re taking the paper-based test: can you use a calculator on the GRE? Yes, you can, though there are different rules and regulations governing the use of calculators. On paper-based GRE general tests, you’ll be given a calculator to use on the Quantitative Reasoning section. You can’t use your own calculator, so don’t bring one to the test! The paper-based GRE calculator is very similar to the computerized one: it’s a basic four-function calculator, with a square root button and memory functions. The main difference is in how it handles order of operations — instead of being based on PEMDAS, it’s instead based on order of entry, left to right. Take the example from earlier of 4 + 6/5. On the physical calculator ETS gives you, the answer (if you don’t use parentheses) will be 2, because the calculator will automatically read 4 + 6/5 as (4+6)/5 = 2. The best way to practice for this is to buy your own four-function calculator (i.e. one that looks like the GRE calculator) to use in practice. Remember, though, you won’t be able to take an outside calculator with you into the test, so don’t get too attached to a specific calculator. We’ve covered what you can do with the GRE calculator above, but how can you use a calculator on the GRE effectively? I’ve collected some of the best tips for using this tool below. Don’t use the GRE calculator for simple math that would be quicker to solve without a calculator. Not only is it simpler to solve things like (4*8) or (2400/3) without going through the calculator, but it also cuts down on entry errors (i.e. accidentally typing in 2400/4) that could affect your answer. Use the keyboard of the computer, rather than clicking each number/function, to save time. You should be able to use numbers on the keyboard enter in numbers to the calculator (although you may not be able to use the num pad). Similarly, you may be able to use other common shortcuts like *, -, /, +, =, and the return/enter key instead of having to click the functions on the calculator individually (and go back and forth between keyboard and mouse). 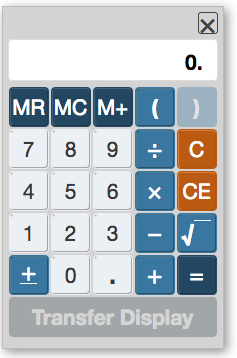 The one limitation is that you can’t use the backspace, delete, or C on the keyboard to clear the calculator display. Keep order of operations straight by using parentheses and the equal sign. If all else fails, you can solve for one part of an equation at a time, write what that answer is on scratch paper, solve for the next part, write that down, and so on. But using parentheses and the “equals” function speeds up the process tremendously. If you find you’re reaching the limits of the calculator’s capabilities (for example, too many digits for the screen), you’re probably making an error in your approach to the question. No question will ask you to go beyond the limits of the calculator’s abilities. For example, if a question has exponents in it, you’ll be expected to use your knowledge of the rules of dividing, adding, multiplying, raising to a power, and factoring exponents, rather than brute force approaches of multiplying everything out. Can I use a calculator on the GRE? Yes, on the Quantitative Reasoning (i.e. math) section. Can you take a calculator to the GRE? No. You’ll use an on-screen calculator on the computer GRE and be given a four-function calculator to use with the paper GRE. Try out the GRE calculator online by getting PowerPrep. Remember that, like your phone calculator, the GRE calculator follows order of operations – use parentheses accordingly. Most problems on the Quantitative Reasoning section are faster to solve without the calculator, so don’t rely too heavily on the calculator. You can have a calculator on the GRE, but what about scrap paper? We have the scoop about scratch paper on the GRE. What can you expect from the GRE besides a calculator? Discover more about the GRE test format and what’s on the GRE. Thinking about taking the GRE, but not sure when’s the best time? Find out how long you need to study for the GRE and read our complete guide to choosing the best GRE test date for you.